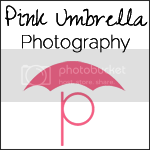 Pink Umbrella Photography: Using Mod Podge With Pictures! Using Mod Podge With Pictures! 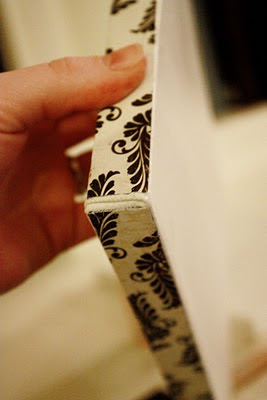 You can also look back to Sassy's mod podge tutorial for the original instructions. 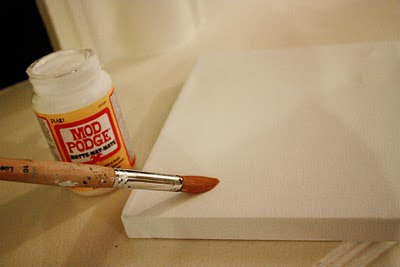 First: Apply a thin layer of mod podge to your entire canvas including the sides. 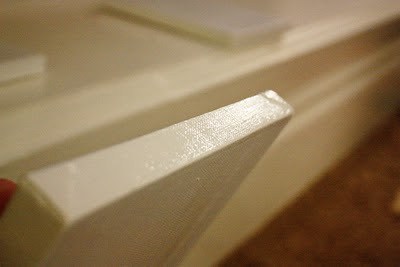 Second: Make sure your strips of paper or fabric are pre-cut to fit the sides of your canvas. Cut them now if you have not already done so. Once the mod podge is dry you then will re-paint as additional thin layer on only one side of your canvas. Make sure you only do ONE side at a time. 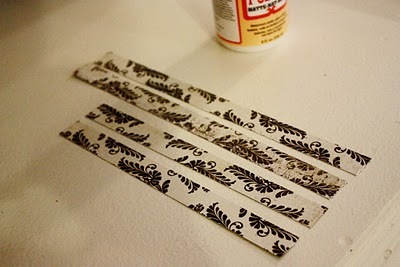 Put another thin layer of mod podge on each strip to add a better stick to the paper or fabric. 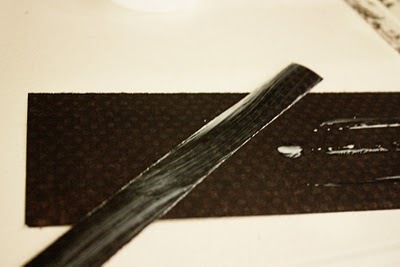 Third: Place your strip of pre-cut paper or fabric on the edge of your canvas and smooth it over with your fingers really well. Make sure there are no bubble. 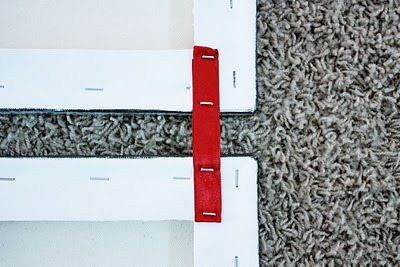 Repeat this step until all sides of your canvas are covered with your pre-cut paper or fabric strips. Your strips do not have to line up perfect because we can put paint in there to cover up the gap. 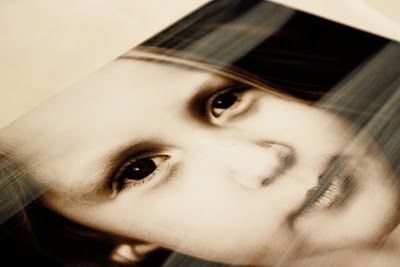 Fourth: Tear off a large piece of wax paper a little bigger then the picture you are working with. Also, make sure that your photo you are working with is the same size as your canvas. 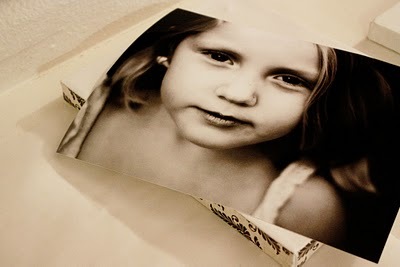 Place the photo face down on the wax paper and apply a pretty good amount of mod podge to the back of your photo. Fifth: Turn the photo over and smooth it onto your canvas. You can cover the photo with your soft towel to smooth out the picture and make sure there are no bubbles. Wait about 20 to 30 minutes for the mod podge to dry completely. Sixth: Put a small layer of mod podge on the front of your picture. It will look milky white at first but it will dry clear. The photo on the left below is almost dry, and the photo on the right was just mod podged. Let the mod podge dry for about 20 minutes. 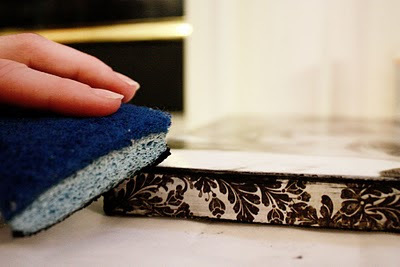 Seventh: You can use your dry brush or sponge for this step. Make sure the brush or sponge is completely DRY! 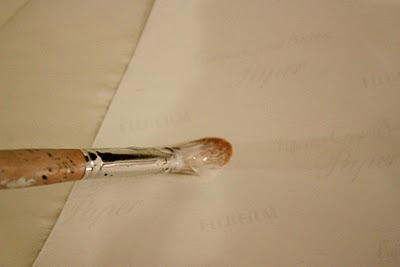 Dip the brush or sponge into a small amount of paint. You can wipe your brush or sponge on a plate to make sure you do not have an excess amount of paint. Then dab your sponge/brush along the edge repeatedly until it is as dark as you want. And here is what your mod podge canvas picture should look like!! Nice! Adding a few more in the same colors looks really pretty on your wall. You can leave your pretty little canvas pictures like this picture above, on your wall, or you can add some ribbon to hang them with. It just depends on what the style is you are going for. 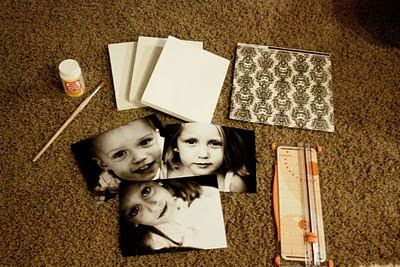 Adding ribbon to your mod podge canvas pictures. 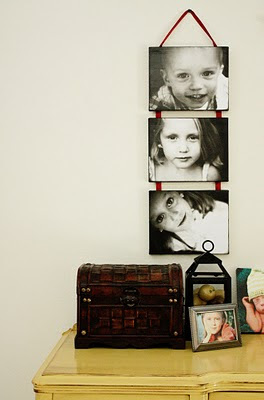 First: Put your canvases in order, the way you want them to look when you hang them on your wall. You must also decide how far apart you want each picture from one another ( 1 inch, 2 inches... etc). Multiply that number by 4. Measure your ribbon out to that length. Cut as many as you need for holding up canvases below. For three canvases you will need four ribbons in this same length. Second: Get your ribbon ready to staple. 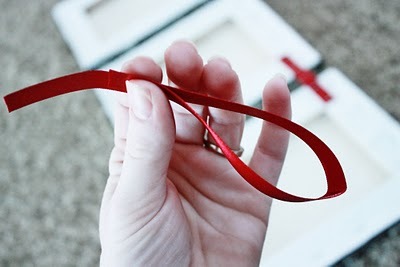 Fold your ribbon with about a 1 inch overlap. 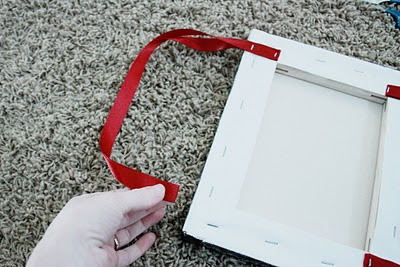 This gives the ribbon more strength when holding up another photo canvas below. 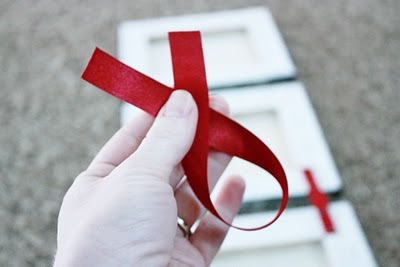 Third: Staple your ribbon to the canvas. Its best if you staple the ribbon 1 inch or so in from the edge of the canvas. Use two staples, one on top and one on bottom for additional strength. Repeat if needed. Fourth: Its best if your unraveled your ribbon a little to look and see what you think looks best and to see how long or far apart you want the canvases to be together. Then cut double the length for the extra strength. 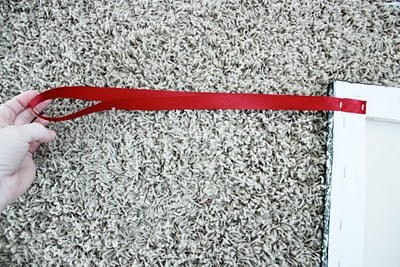 Stretch your ribbon flat and then fold it over to the other side. 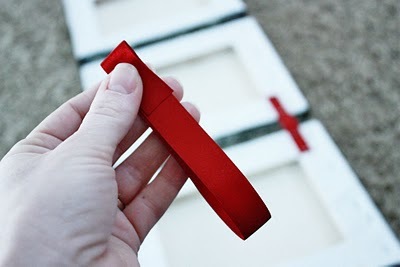 Again, make sure your ribbon is 1 inch or so from the edge on the canvas. 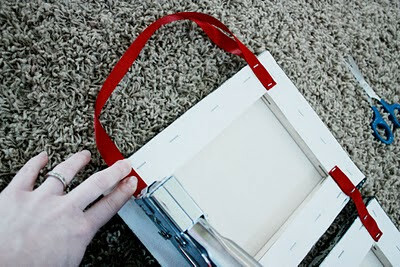 Fifth: Staple your ribbon and use two staples on each side. And now you are done. Just hang with a nail or a cute little hook. This idea also works for great Christmas or birthday gifts. 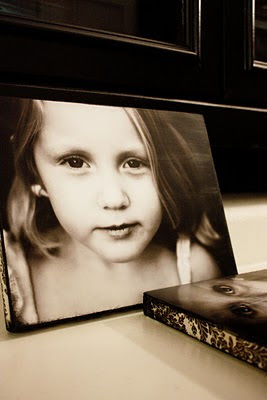 These are very nice...I think I will try this with some pictures of my grandsons...it would make some nice Christmas gifts for their mommies! Thanks for sharing! I was thinking the same thing. They would make GREAT Christmas gifts. Let me know how they turn out. What an elegant way to display your lovely photos! I really LOVE this project! Beautiful photos too! Thanks for sharing! Glad I could help inspire your idea... I am sure it will turn out great. Let me know how it looks. Nan, Thank you so much. Hearing it from other people help me keep on going. Thanks for stopping by and I will hop over to your and check it out. BEAUTIFUL! I am so glad you shared at One Artsy Mama! I love this idea! Great idea for Christmas gifts. This project turned out beautifully! I'd love to do something similar with my little guys. Thanks for sharing at Taking A Timeout Thursday. I can't say anything but WOW! that project turned out amazing! I'm a new follower and i'd love if you followed me back! I love it! I am totally doing this as a christmas gift for at least 2 of my friends! It looks great! Thanks for sharing. thanks so much for posting this. I have been wondering if I could use actual photos to mod podge. 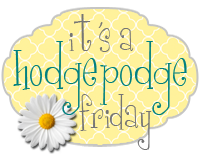 question... did you use regular podge or the paper podge? I have always just used the regular Mod Podge. I dont think I even own the other. I wonder what the difference is. Thanks for stopping by. Wow-this looks amazing! I would love for you to link up at my party going on right now! I was recently 'turned on' to the idea of Modge Podge and your photos turned out beautiful! Phenomenal Post and great tutorial. 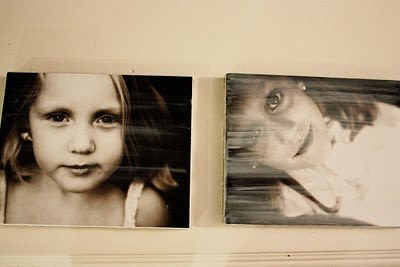 Thanks to Modge Podge for helping us put our Photos on Canvas.